Asics Gel DS Trainer 19 are stability performance running shoes. The popular Asics Gel DS Trainer 19 is the first name that comes to almost everybody's mind when talking about performance running shoes with pronation control. Is so famous that japanese brand has released a version for neutral runners. 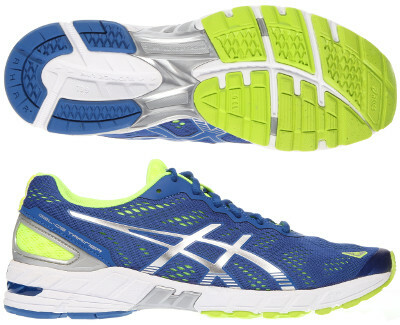 It is a really versatile model featuring great performance with its outstanding blend of cushioning and responsiveness. Valid for practically all kind of workouts and racing. Not many changes compared to its predecessor the Gel DS Trainer 18 and they show up mainly in the redesigned upper with new lightweight and breathable mesh. It is so thin that gives the impression to last much short than rest of the shoe, not great so much concern about durability. Heel counter provides some rigidity for extra stability and has reflective elements for more visibility under poor light conditions. Rest of Gel DS Trainer 19 keeps what has been working fine. Midsole is mainly made of Solyte with Gel® in both heel and forefoot for shock absorption and Dynamic Duomax to provide pronation control. Plastic shank features extra support and divides outsole in two areas: rearfoot with durable AHAR+ and forefoot with blown rubber for more grip and comfort.